We’re not taking part, we’re taking over! 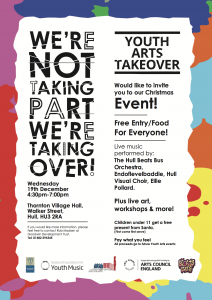 Goodwin Development Trust are launching the Youth Arts Takeover, a series of creative arts events co-designed with young people in Hull. The project’s first event will be held at the Thornton Village Hall on 19th December 2018, and will be open to drop into anytime between 4.30pm and 7.00pm. Attendees will enjoy a variety of performances and displays, as well as live music from an assortment of acts, including the Hull Beats Bus Music Orchestra. The Beats Bus have recently won an award, as well as being featured in Sean McAllister’s ‘A Northern Soul’, recently shown on the BBC. The Youth Arts Takeover Project is being run by Goodwin Development Trust and funded by Arts Council England and the National Foundation for Youth Music. It aims to engage young people with arts and creativity in a way they may not previously have been, and also to build up other skills, such as events management. 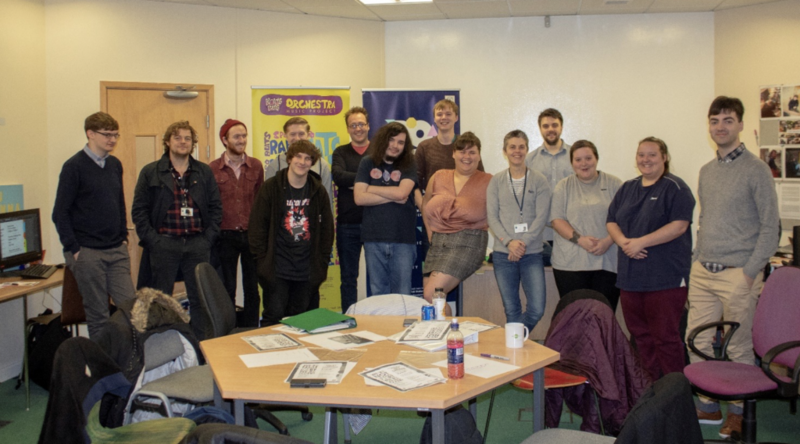 The hope is that this project will help to build confidence and skills for the young people taking part, as well as creating fun events for the community to take part in. The event is open to all members of the public and is suitable for all ages, including children. Food and drink will be available, and entry is free for everyone. Line-up includes Endoflevelbaddie, The Hull Visual Choir, local singer/songwriter Ellie Pollard, and the young peoples’ Hull Beats Bus Orchestra. Live art will be on show, as well as participatory art workshops, and children under 11 will get to meet Father Christmas! For more information on the event, or if you would like to get involved in the project, please contact Rob Madsen at Goodwin Development Trust, 01482 587550 /rmadsen@goodwintrust.org – or simply turn up on 19th December. Be the first to comment on "We’re not taking part, we’re taking over!"